Unless he’s plotting some big career change, Gov. Greg Abbott won’t be on the ballot again until 2018. And if you or a close friend wants to challenge him then, you have some work to do: Abbott ended 2015 with $22,470,111.82 in his campaign accounts. Money is the armory of politics; a large-enough pile can intimidate potential rivals. And other officeholders have taken note, collecting towers of money like medieval rulers erected castles. Abbott’s fortress is formidable, but others are building, too. Lt. Gov. Dan Patrick has more than $7.5 million on hand. House Speaker Joe Straus has $8.9 million. 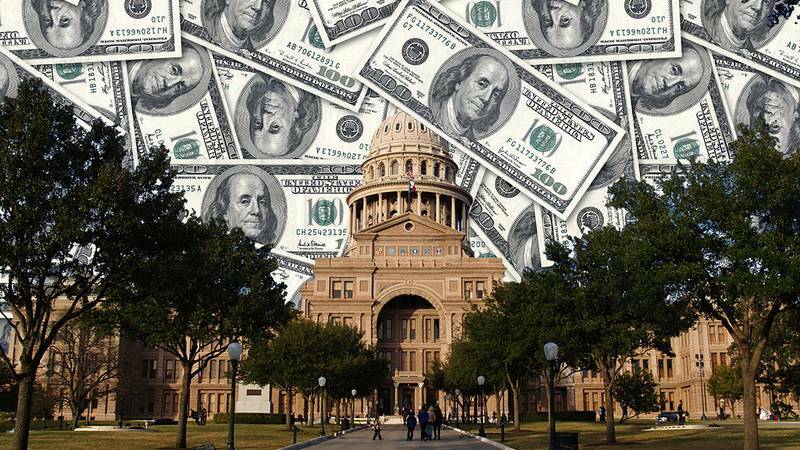 Now it’s true that Texas is a remarkably expensive place to run a statewide campaign. But Abbott already has all the money he should need for a GOP primary — and then some. If things work out the way they did in 2014, he has enough money to scare most of the serious opposition away. Rick Perry was governor for 14 years. There was some pent-up demand among the state’s politically ambitious conservatives. Lots of people see governors and presidents in their bathroom mirrors every morning when they’re brushing their teeth. Even with Perry and most other statewide officials getting out of the way voluntarily, those ambitious pols found two obstacles in their way in 2014. Another Republican might challenge Abbott when the time comes, but that candidate will need enough money to compete. If opponents haven’t raised it when the race starts, they will be preoccupied with fundraising while Abbott is free to talk to voters and campaign. Ambitious shoppers in politics look for weak spots. Money can be one of those, but it’s not the whole game. Attorney General Ken Paxton had $2.5 million on hand at the end of 2015, for example, but his legal problems could leave him vulnerable in the 2018 elections. Paxton has been indicted on securities fraud charges and is under criminal investigation for his part in a Collin County land deal. Potential opponents could ignore his financial advantage when they’re making their decisions. If he’s exonerated by then, the money — and the exoneration — could well protect him. Democrats face huge hurdles in top-of-ballot races in this red state no matter how much money they have. Wendy Davis and Bill White — the last two Democratic nominees for governor — lost lopsided races in 2014 and 2010. But it wasn’t for lack of money. The Republicans in those races had financial advantages, but both of the Democrats had enough to run strong campaigns. They just couldn’t overcome the conservative stampede in those races. Most of the executive statewide elected officials in Texas are not on the 2016 ballot; the exception is an open seat on the Texas Railroad Commission. Most of the elbowing and positioning that precedes an election has not started for the next round of races. But people are watching. Abbott’s numbers are daunting, as are those for Patrick, Straus, Paxton, Comptroller Glenn Hegar and Bush. One — Agriculture Commissioner Sid Miller — stands out in that pack. Miller, who won a five-candidate primary and the runoff that followed in 2014, had only $20,825 in his political accounts at the end of the year. He’s great at getting attention, and a lot of voters will know his name whether he’s got money to advertise or not. But some of that attention might prove to be the wrong kind for some voters: Miller made headlines for bringing deep-fat fryers back to public school cafeterias, for insensitive social media posts about Muslims and communists, the Middle East and Japan, refugees and rattlesnakes, and for proposing increases in a large number of fees levied by his state agency. Each of those things is popular with some group of voters but unpopular with others. It’s enough to make a potential challenger sniff around, anyhow, and Miller has some work to do: In Texas politics, $20,825 doesn’t offer much protection.